In addition to feeling and releasing ALL THE EMOTIONS, my sessions with Brandon Hyde (a certified Emotion Code practitioner) have given me a brand-new perspective on all this stuff I’ve been doing. And by “stuff,” I mean the endless doctors appointments, decision-making, non decision-making, check-writing, bill-paying, days of tears, days of hope, needles, herbs, supplements — you know, all that. And it’s not just that Pollyanna “It’ll all work out for the best” sentiment that I’ve heard a million times. It’s that we’re preparing for baby. 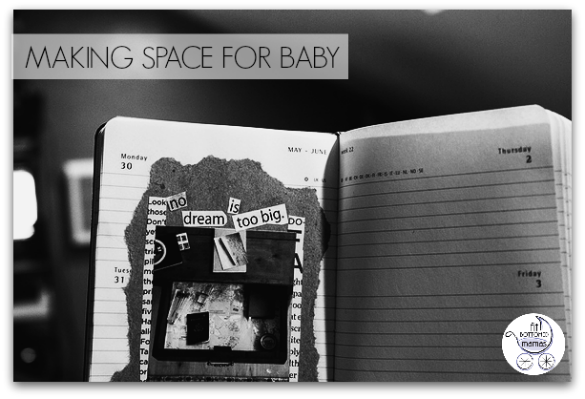 Making space. Clearing room. Preparing … now that resonated with me. We here in America don’t really have that mindset or that tradition. For better or worse, we want a child and we expect to get it. Now. (I know I did.) But the whole concept of taking some time to do all of this “stuff” so that we’re more open, more evolved, more grateful and more loving? Well, that sounds darn beautiful. Gosh knows, I’ll do what I can to make the most of this difficult situation and continue to try to accept it all with grace. (And I know from some of your comments that hearing my honesty helps you — so hopefully this little aha-moment of mine makes you feel better, too!) So making space? I can so dig that, fit-bottomed-baby-to-be.